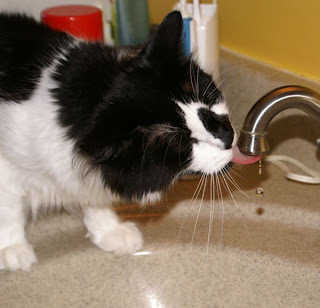 You can teach an old cat new tricks. I love old postcards and they give me a lot of inspiration for new ideas. I seem to have gotten into the halloween mood and this was a piece I had to see punched. It was really fun doing her. It is all in 6 strands with DMC, some that I have over dyed. It shows that you can do some shading, even with prim sizes. I hope you like you, she will be for sale this weekend, on ebay. I debated on aging this piece, it is darker in person and I hate to lose the details by staining it. If there is enough interest, I will make a pattern for this one. 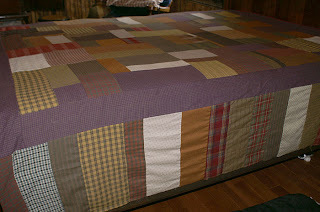 I finally sat down in my sewing room and added the borders to my scrap quilt. 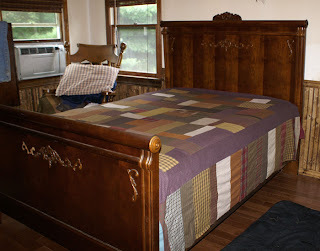 I then added strips of the colors along the two sides to cover the sides of the bed. My plan is to use black floss to make tacks in the blocks instead of top stitching. I wanted to do something quick and easy. I do need a border around it though, I will probably go with plain black since it will be part of the binding. 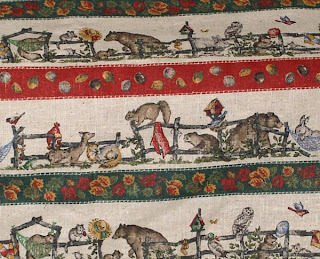 I was thinking, this would make a great quilt for practicing free motion, but I want to just have something to cover the bed, for now and then I can work on something nicer for a winter quilt. I think it will look better once the batting and black ties are in. 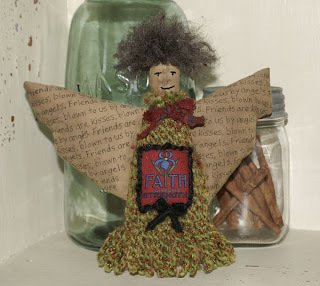 It is a good example of what you can do with lots of homespun scraps. To show you that I can actually sew and make dolls, when I am in not in a demented state of mind, here is a kitty doll I made years ago. I used to make these and sell them, but haven't done any in ages. 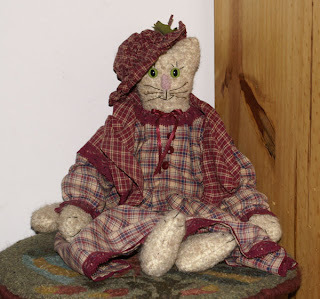 One of these days I will get back into dolls and maybe creating something new and more primitive. I decided to make a new punch from old designs. I used my pumpkin and crow pattern along with a kitty I had done. It was a fun piece to make and I used a lot of my hand dyes in it too. This piece will be going up on ebay tomorrow night. I am also going to offer this pattern free, to anyone who orders a pattern this week. So, if you have been thinking about trying one of my patterns, now would be a great time to try one. For those of you who have already ordered patterns, I will be emailing you a copy too. 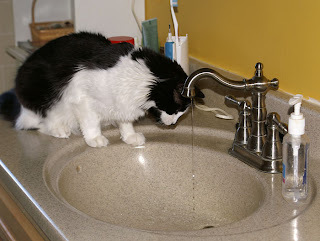 Izzy always watches as Dora goes up to the sink for a drink. 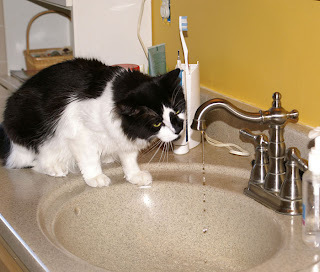 Dora only drinks out of sinks, Izzy prefers toilet water and dirty sink water, ugh. Today Izzy got up and watched Dora this time and when Dora left, Izzy finally decided to give it a go. Here she is contemplating how the water is coming out and how she is going to get some herself. She finally braved sticking her tongue in the water. 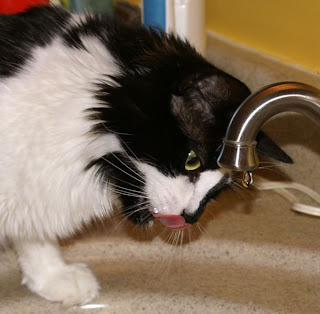 I had to do a drip for her, Dora prefers the water to run slowly. I finally sat down and finished making the new pieces into epatterns. The first is the one, everyone has been waiting for, the dog and cat patterns. There is a pattern for both versions, so you can decide how you want to do them or add a few of your own touches. The second set is the sheep patterns. I have also done both versions of these with the epattern. 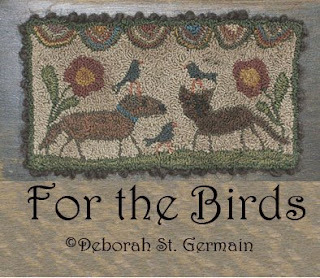 I hope those that buy the patterns, will share photos of their finished pieces with me. I love to see how everyone does them and changes are welcome, I think we should put our own personal touches into our pieces. You can find the patterns at my ecrater site. 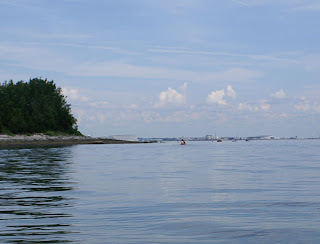 Yesterday I wanted to go paddling again and since we got a late start, we went to the local launch on the bay. 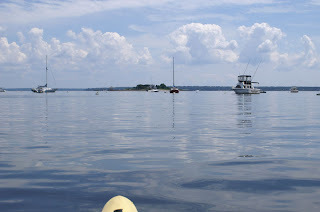 Today I took a break, need to rest once and awhile and eventually I hope to get strong enough to do day long paddles. I worked on my long runner, I just might finish it before the summer is over. 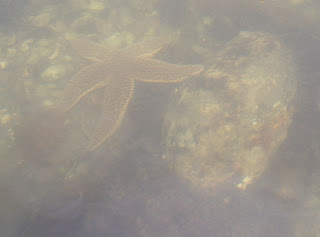 I always get out first, bill is so slow and maybe it is because he pushes me off the rocks first;) While I was sitting there, I could see groupings of starfish all over the rocks. And this is Bill, going back the way we came. He couldn't remember if he locked the car, so he had to paddle back to check. He is in much better shape than I am, so the extra paddling was easy for him. I just sat on the water, it was so calm and beautiful out. I enjoyed the scenery and watched the boats putting out pots for oysters. We went as far as the Jamestown Bridge and took a break. You can see further up the bay and Dutch island from here, so beautiful views. It was way too cold for me to swim. 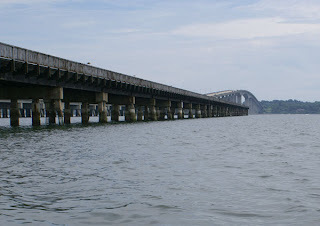 This is what is left of the old bridge, with the new bridge spanning across the bay. Going back was nice, the tide was coming in and the wind was at our backs. I decided to make a new piece with the sheep design. 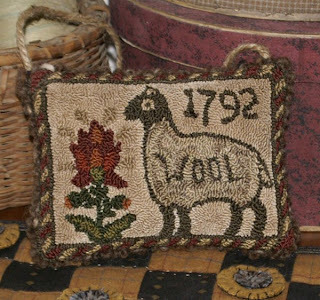 This one I added a date and the word, wool on the sheep. I also used a higher height for the design and border and the lowest height for the background to give it a sculpted look. I like how it came out, it reminds me of old siganage. It will be up for sale tonight, on my ebay site. I am working on the patterns. For some reason the scans did not come in as good as I planned, so I have a bit of cleaning to do, so I can give you the best possible graphic when you print them out. They should be ready this week. Today I was finally feeling good enough to get out and go paddling. And, the weather was perfect for once. We went to Burlingame state park. 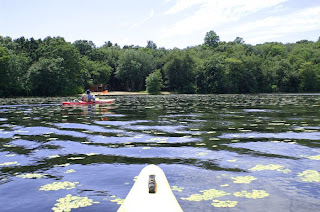 It is a large lake and lots of shallow waters, so I can paddle and jump in for a swim when we get too hot. It was really nice getting out in the boat, finally and enjoying the water and scenery. I made a purse yesterday, or a pouch, something simple and will hold items. I used yarns and appliqued some wool too. It was fun and easy to do. The flash grabs the colors and makes things stand out, but the yarns are actually punched into the background. Today I tried a new idea, a pumpkin, mostly filled in with yarns. 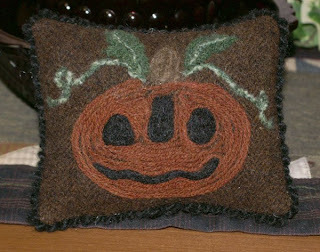 The orange is an old yarn I got and over dyed, so it is rougher and didn't felt as well, but give a nice effect. 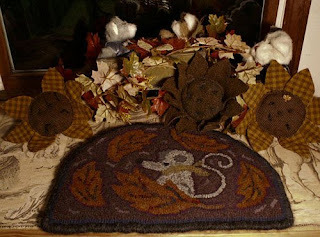 The leaves are done with a hairy wool, so it felted right into the backing. Today I got a book from the library, to make small animals. Not sure if I can do that, but it would be fun and I would use the real roving for them. Both eyes were the same, when I started, lol. A friend sent me a package of needle felting wools that she no longer used, and I have always wanted to try it, so was thrilled to get the package. I do a number of crafts, so I cannot afford to buy more equipment and found ways to cut the cost. The first thing I needed was a felting tool. I used my Jo anns coupon and got a clover three prong tool, it is the perfect size and less than the large one. The three prongs work great on the types of projects I do and you can go to one prong if you are doing fine work. They sell some type of brush to needle felt on, but I used an old block of heavy foam that was in my camera case. 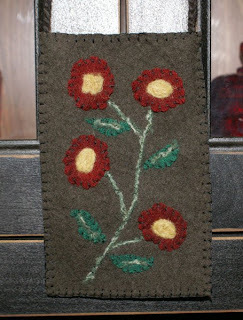 I wanted to try it with wool leaves, to see how it worked and looked for stems, instead of couching or stitching them. I really like the look and I took a picture, but it looks like the yarn is just sitting there in the picture. I had to use flash at night, but you can get the idea of how it works. What I wanted to test, was what can be punched into the wool. 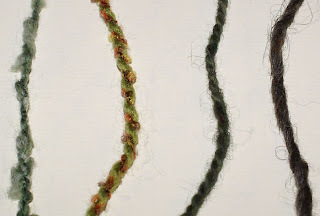 I tried two wools, one lopi and heavy and one old stiffer wool I had, that is the two darker ones on the right. The greens are acrylic yarns that I found in a thrift. And here are the results. The lopi was hard to punch, thick and unruly. It would be good for larger projects though. The stiffer, thin wool worked beautifully but my favorite was the green with white bumpy stuff in it. It punched in, as well as, the wool and the texture gives it a nice look. The green and brown worked ok, but the extra darker color, did not punch in, as well as, the yarn itself. So here you have it, nothing special, but good for practicing to see how yarns work in wool. On the flower, I used the green and white bumpy stuff, ( there is that technical jargon again;). It really made a nice center for the flower and punches beautifully when wound into a circle. Another difference was the wools. 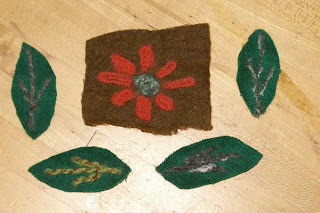 The leaves are a softer wool and the square is a very dense, felted wool. I think the denser wool works best with the felting. It will be fun trying the real roving in projects, as well. This week I made a gift for a friend, a fraktur for her birthday. I decided I loved the sheep and the flowers and knew I just had to punch it. I added a border to match the colors and love how it came out. I will be making a pattern from this one and adding a different version of it. I will also make up the dog pattern too, I was laid up and doing patterns entails running up and down stairs, so this week they will get done. If you like this piece, it is on ebay tonight. Would love to see it go to a good home. I was rummaging through the trunk and found some things I had forgotten about. I have some yardage of materials I bought on the dollar table, and some will make great quilt backings. This first piece is about two yards. I thought it would make a good tablecloth, well you can see it didn't make it on the table. So, wondering what I can make with it, thinking some curtain toppers might be nice. Then I pulled this piece out. I bought it 18 years ago, along with a floral one. I love bargains and they were on sale. I started painting it, but not sure why I never finished it. 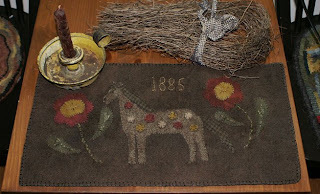 It is a bit bright for my tastes now, but maybe if I finish it and then antique it, it would make a nice floor rug. For where, I have no idea, lol. I gave her some today, she loves to eat it and roll in it. And if anyone comes within her claw radius, you better watch out, she seems to think ripping you open is part of the experience. Izzy watched for a while and decided to stay clear, which meant flying through the air to land on the side of safety. Of couse I clicked to late and got her landing. 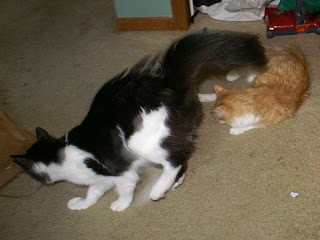 They both love to jump at things and at night I can hear the thump, thump as they land on the floor. The glass doors are their entertainment for the night, as they jump to try and grab the moths on the other side. 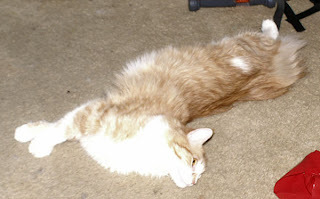 Dora can be vicious when she if on catnip, but then she zones out and goes into la la land, as you can see. I finished a new piece today and once I finish it off, I will post a picture. I will have a pattern for it, as well as, the dog and kitty I still need to do. 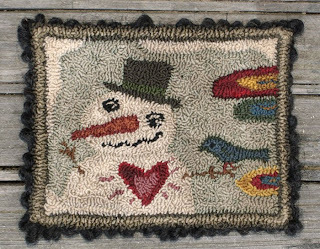 I had a request to make a rug hooking pattern on linen for a customer and decided to make an extra one, for those of you who prefer patterns that way. I am offering the second one for 55.00, which includes shipping and insurance. 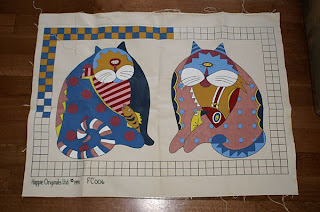 So, if you loved the dog and cat pattern that I made in punch, you will love to make this one for your home. I plan on making one myself. All lines are drawn on the straight of the grain and the missing elements such as eyes will be in the pattern, before it gets sent out;) If you are interested you can email me. I will take paypal or a postal money order. You can email me if you have questions about payment. No international orders on this one, sorry. While I was getting linen, I remembered I had another pattern that is looking to be hooked. 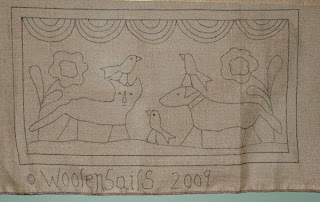 This one is a pattern from 2006 and it hasn't found the right person to hook it yet. 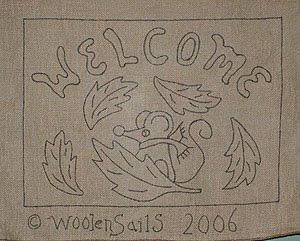 I have made this design in a small mat, but this one is the only one I have done like this and with a welcome. 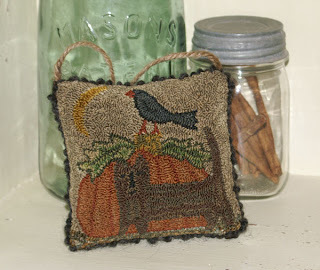 It is a fun piece and a great project to make for the fall. If you are interested, it will be 47.00, which includes shipping and insurance. This offer for US sales only. This is the version I did. This is the pattern you will receive. All lines are drawn on the straight of the grain. Today I decided to sell a piece I made last year, after the holidays. The design is by Betty Dekat. 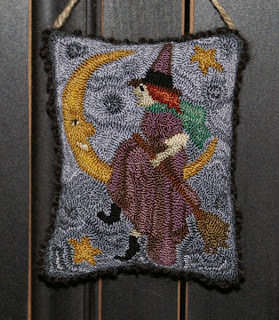 She has wonderful patterns and offers freebies on her blog. I just had to do this one, it was fun and it makes me smile. This is will be the first flatty I am offering. I am not sure how people will respond to that, so feed back about what you think, is appreciated. I intended on mounting it and changed my mind, so now I will leave it up to the buyer to do what they would like with it. It will be listed on my ebay site tonight. I was going to go paddling and show you pictures of me having fun, lol. But, I was having some downtime this weekend and needed to take it easy. I did get to go in my pool finally, it was cold but it felt great and got my muscles moving again. I am lazy today and working on secret projects, so no new things to show you. 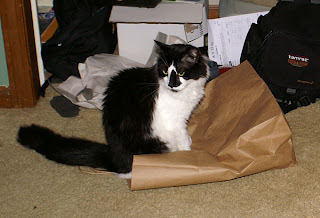 But, the kitties have been being silly lately and find new ways to make me laugh. While I was working on the computer, they decided to play pop out of the bag. I hope everyone has a wonderful Holiday weekend and remembers to thank those who have made this day possible. 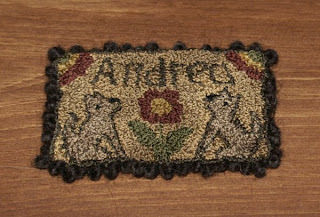 One item was made for a customer who needed a name tag to wear to her rug hook ins. 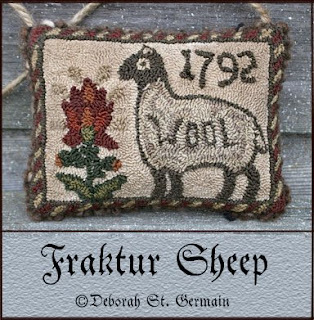 She loves my fraktur dogs, so I made her one with them and her name. I think it came out great and would be fun to make more. The next item is a piece I made for ebay. I wanted to try the spotted horse in a fraktur and it was fun to do. 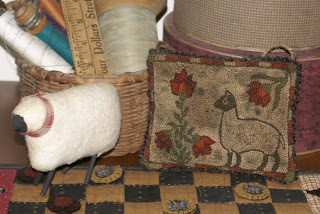 I made it all in my hand dyed wools and a couple as is wools. I used cotton floss to whip stitch and blanket stitch the pieces. The yarn is a bumpy type yarn and it made a great stem and vines. If you like this piece, you can find it on my ebay site. I also worked on my big runner, so maybe someday I will have a finished picture of it. I also have a million other projects going and will be doing up the cat and dog pattern next, for those of you who have requested it.